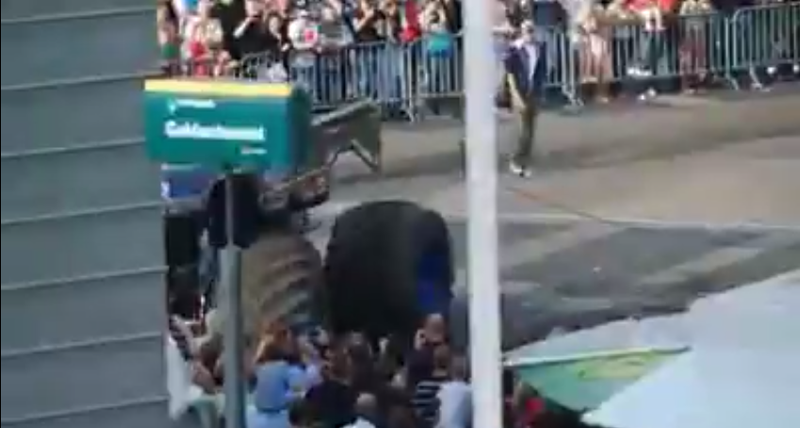 A driver crashed his monster truck into attendees of an automative exhibition, according to multiple Dutch media reports. At least three people are dead, one might be a child, and dozens of other adults and children are injured. Video from the scene (see below) shows the driver gunning the truck's engine before powering over half a dozen cars. The engine revs hard after the truck's rear wheels clears the last car, and the truck hits the pavement hard, before careening around a curve, jumping a metal railing and crashing into a crowd. The first call to emergency services came just after 4 p.m. The NL Times is also reporting that the monster truck is part of a stunt team sponsored by Dutch company Eurol, which makes industrial lubricants. Video of the incident is below. WARNING: at least three people were killed, dozens were injured, and as such, it can be considered extremely graphic. From another angle, it appears as if everything was going fine until the last few moments.